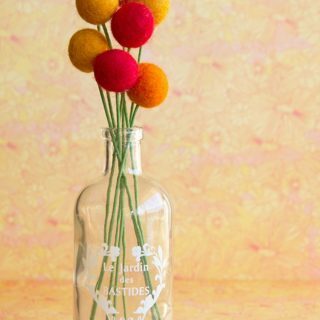 When it comes to unconventional crafting supplies, our kids are great at picking them. We almost have more fun watching them pick what they want to craft with next then we do actually helping them make things because their imaginations are so great. 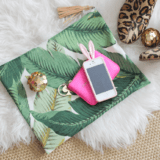 So what’s their latest funny crafting tool obsession, you ask? 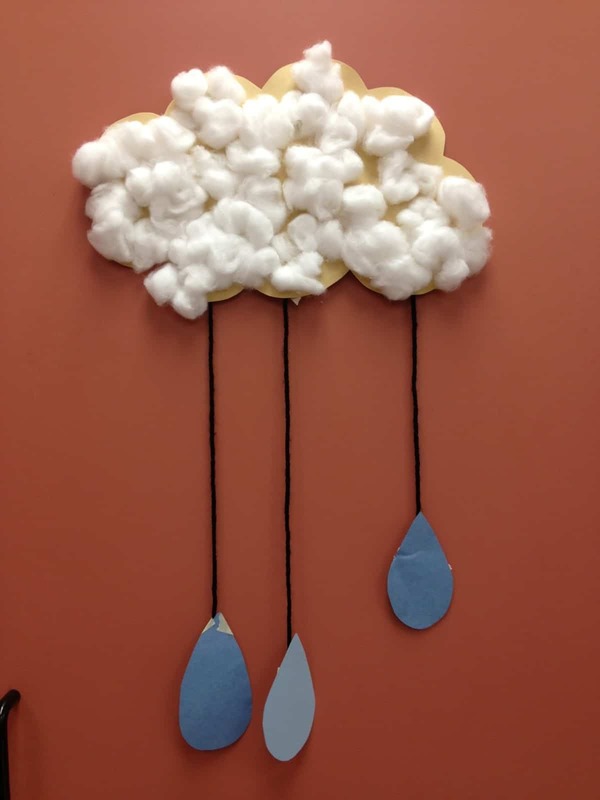 Our kids absolutely love crafting with cotton balls! 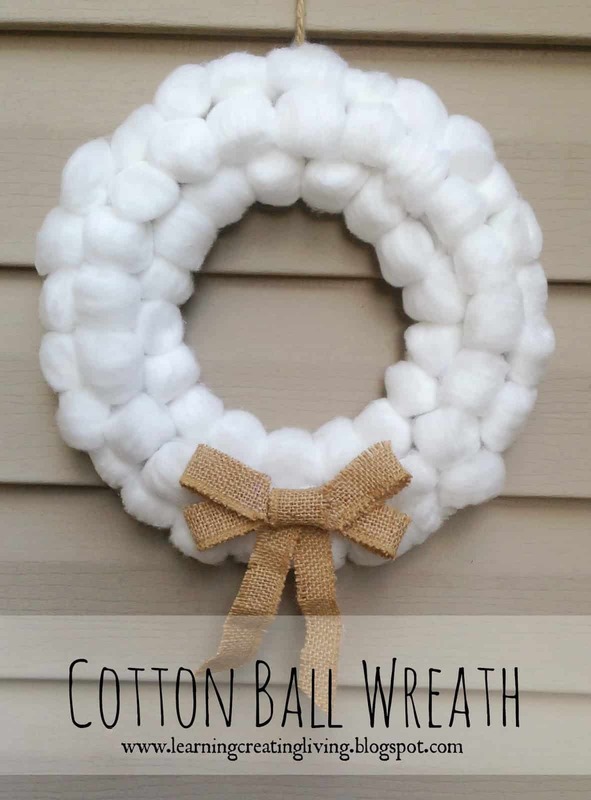 Just in case you think your kids might love crafting with cotton balls as well, here are 15 ideas that we’ve made with ours and that they absolutely loved creating. Play food has always been a big hit in our house. Our kids own all manner of plastic vegetables and we’ve even crocheted them soft little loaves or bread and baked goods. They’ll play with these for hours on end and they’re always a favourite of visiting kids too, so whenever we see play food in stores we pick some up. 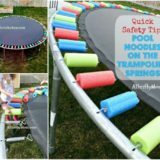 There are some things, however, that just don’t seem to be made by toy manufacturers, so for those things, we make them ourselves. 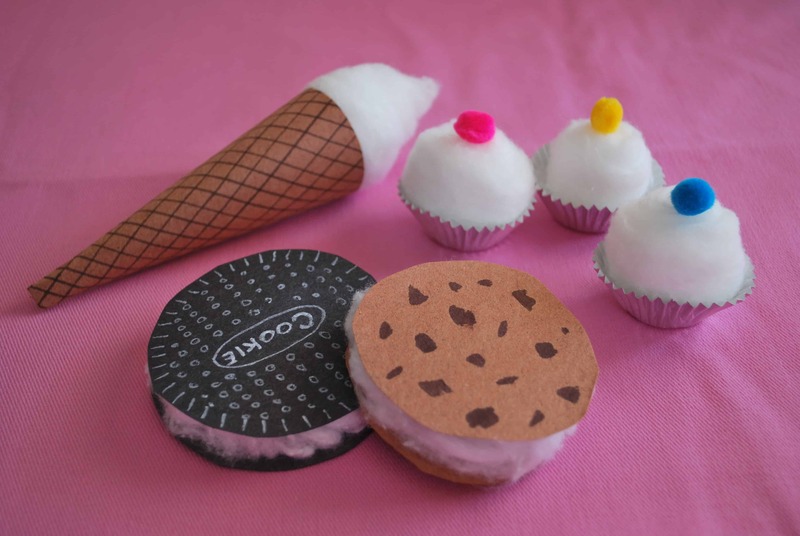 Ice cream treats are one of those things, which is why we helped our kids make these adorable ice cream sandwiches and cones by Mary Helen O Rama! The cotton balls make great fluffy mock ice cream no matter what you’re making. Are you trying to introduce your kids to new foods they’ve never tried before, but you’re worried they might be a little bit picky and not willing to take a bite? 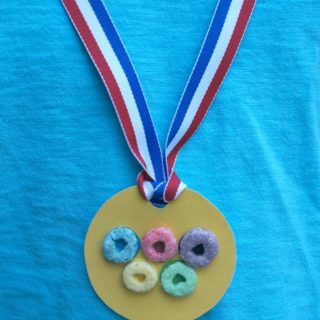 Well, with our kids, if we use play food to make the idea seem fun and yummy before hand, they’re always way more willing to try something new when they see the real thing. That’s why we helped them make their own sushi! 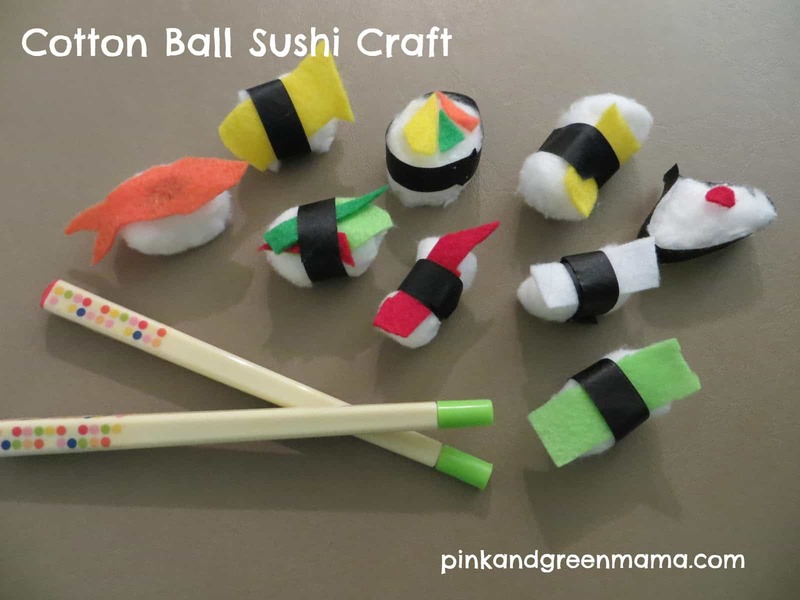 Find our how these adorable nigiri with cotton ball rice and felt fish or vegetables were made on Pink and Green Mama. 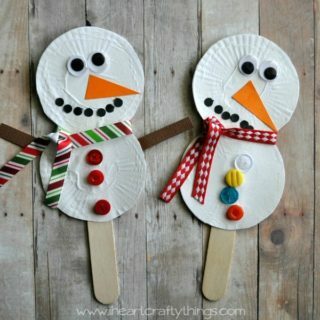 Do your kids love nothing more than making holiday themed crafts? Then we’d be willing to bet that they’re already just as excited for Halloween as our are, even though their summer holidays aren’t even technically over yet! 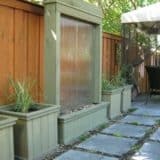 That’s why we start collecting Halloween craft ideas now, that way we have lots of options and ideas when the fall comes so they’re never bored. 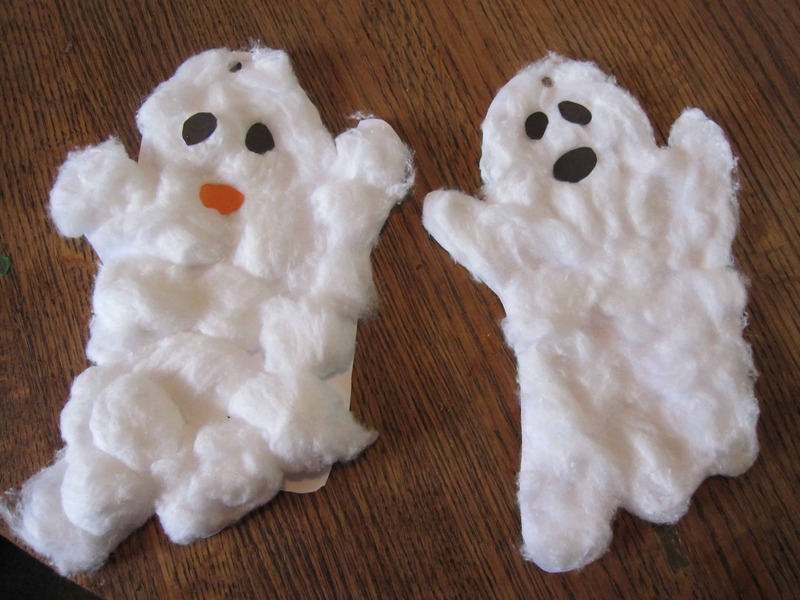 These awesome little cotton ghosts featured on LibrErin are always a hit in our house. 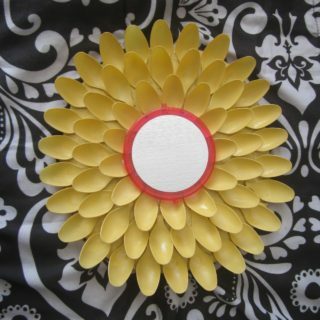 Perhaps your favourite thing to help the kids craft is home décor, because that gives you lots of kid-made things to hang up around your house? We love when visitors can see and admire our kids’ artwork and they love showing off the things they’ve made. 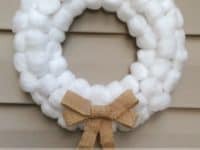 Recently we made this adorable cotton ball door wreath together and they were very pleased when we put the bow on as a finishing touch. Check the whole idea out in more detail on Learning, Creating, Living. 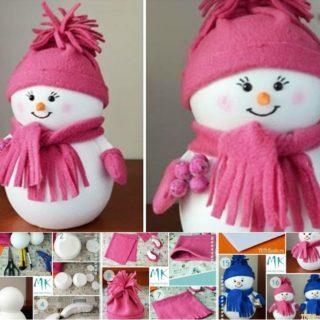 Speaking of holiday themed crafts, were you a big fan of the idea of stockpiling crafting concepts for your kids for upcoming seasons, when they weather is colder and they’re stuck inside most days trying to find things to do around the house? In that case, here’s one for your archives! 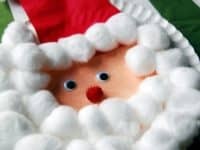 Family Ever After shows you how great a Santa beard cotton balls can make. 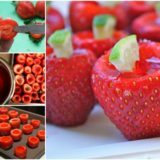 Perhaps your kids love crafting food just for the sake of DIY, even if the end result isn’t a toy they can play with? 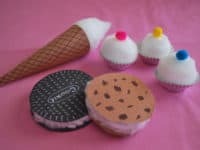 In that case, cotton balls make all kinds of awesome food themed things! 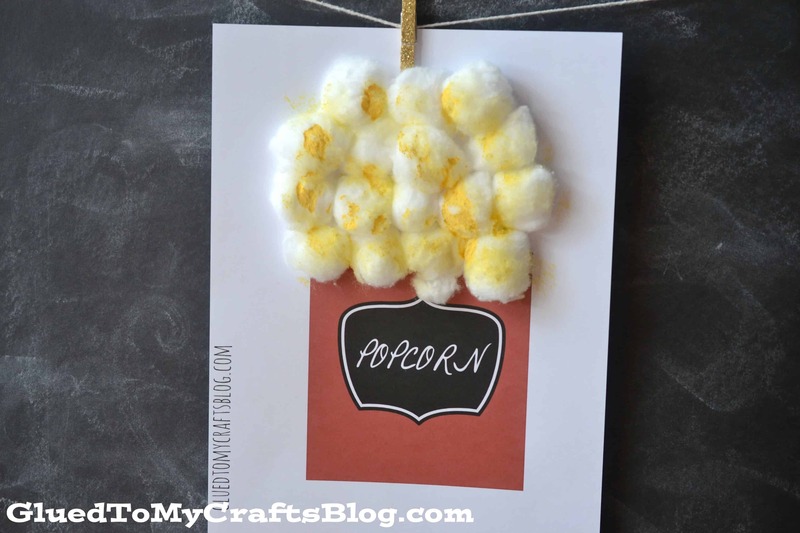 We recently made some awesome cotton ball popcorn with our kids, complete with painted butter. 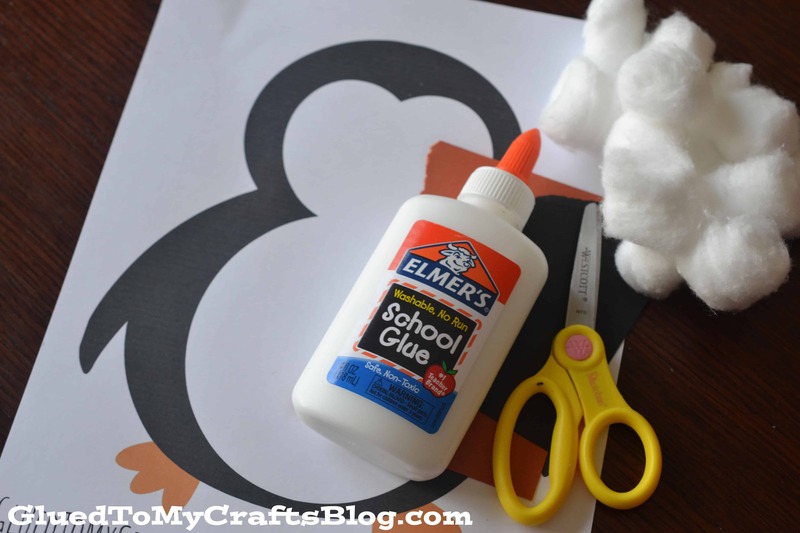 Find how to recreate the craft on Glued to My Crafts! 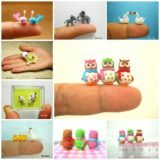 Just in case your kids get tired of making food, here’s an alternative idea because crafting cute little animals is always a blast as well! The texture and volume of cotton balls makes great sheep’s coat, for example. Besides crafting with cotton balls, our kids also love painting with their fingers and hands whenever they can, so this craft from I Pinned It, which uses a painted handprint as the base of the sheep, is one of their favourites. 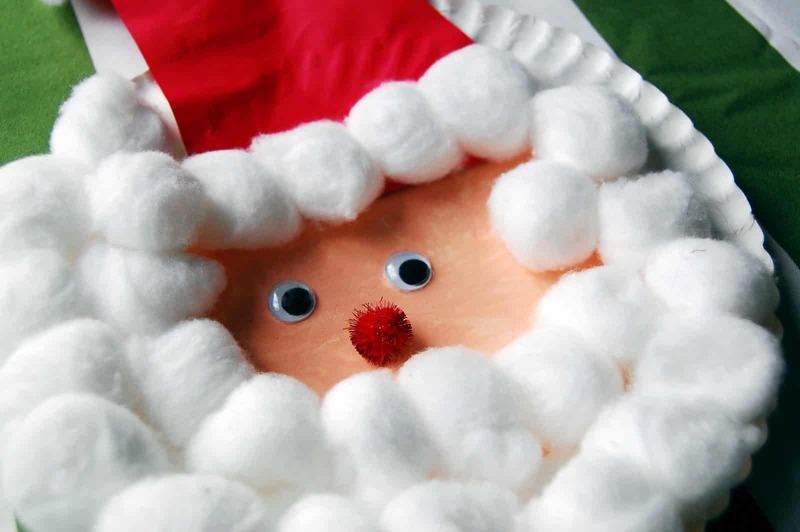 Okay, we know we’re getting a little ahead of ourselves in the seasonal craft pre-planning with this one, but we think it’s so cute that we just can’t help ourselves. 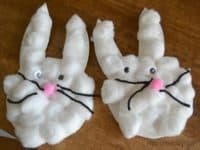 Every year around Easter, our kids make these funny little fuzzy bunnies on a paper base, using cotton balls as the fur, pink pom poms as the nose, and black yarn as the whiskers. 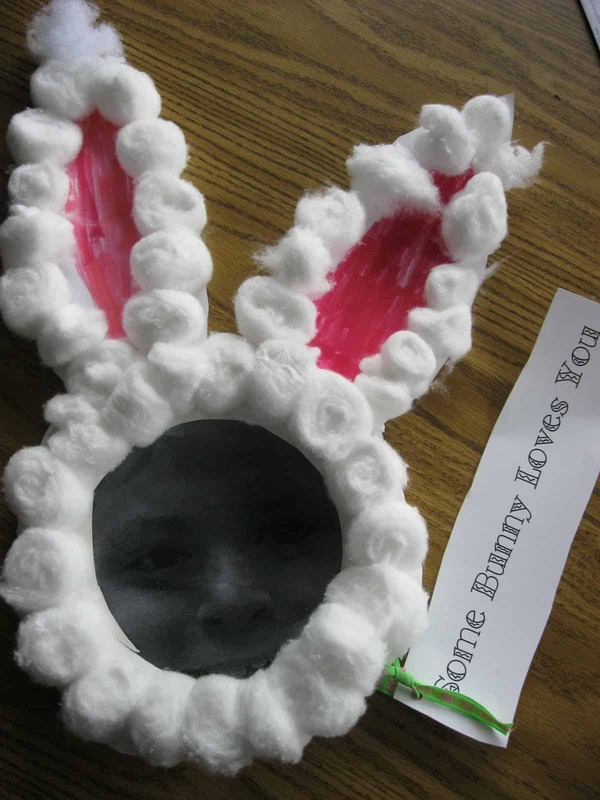 If we’re being honest, sometimes our kids even make cotton bunnies just for fun, even when it’s not Easter! 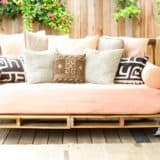 Check out the whole idea on My Creative Days. 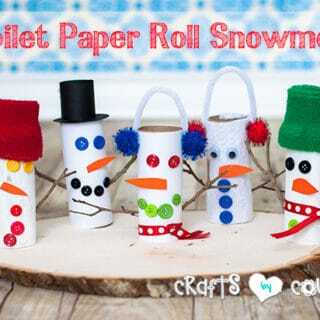 By now, you’re probably getting a clear idea of the kinds of things we usually make cotton ball crafts out of. 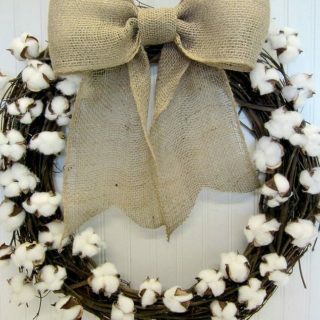 If it’s white in colour in nature, then it’s probably something you can create using cotton! It only makes sense, then, that clouds should be such an easy thing to make that way. 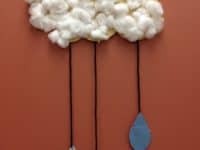 We love this craft from Live Love Learn that looks like a little rain cloud complete with falling construction paper drops. 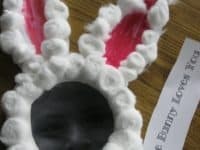 Did you love the bunny idea that we showed you earlier on our list but your kids have made that many times before and you’re not sure they’ll be interested, even though they still love making bunny themed crafts? In that case, check out this adorable spin on the concept by I Love 1st Grade! 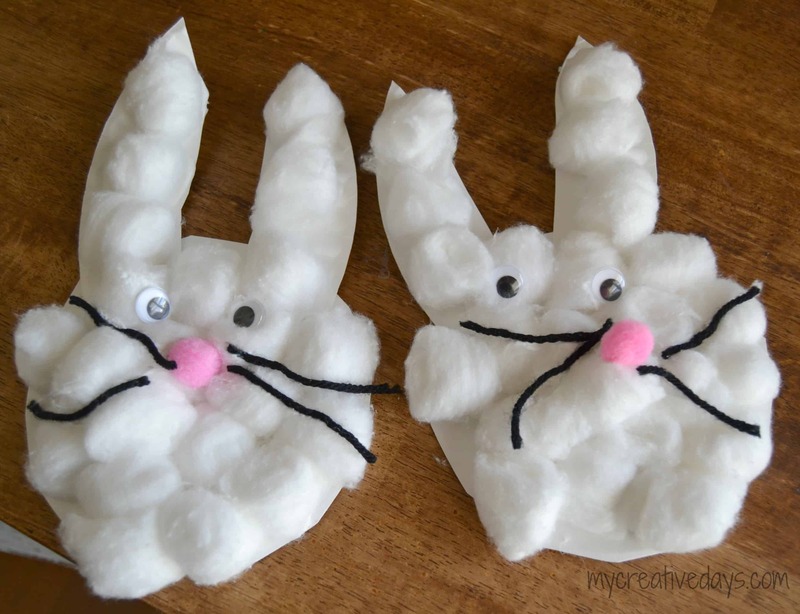 Rather than just making a generic cartoon bunny with your cotton balls, show your kids how to make a fuzzy bunny shaped frame with a photo of themselves inside so they look like they’re all ready for Easter. As you’ve been browsing these crafting options, do you keep thinking about how much the cotton balls remind you of snow? We can’t say we blame you; they really do look like a pile of little snowballs when you get many of them together at once! 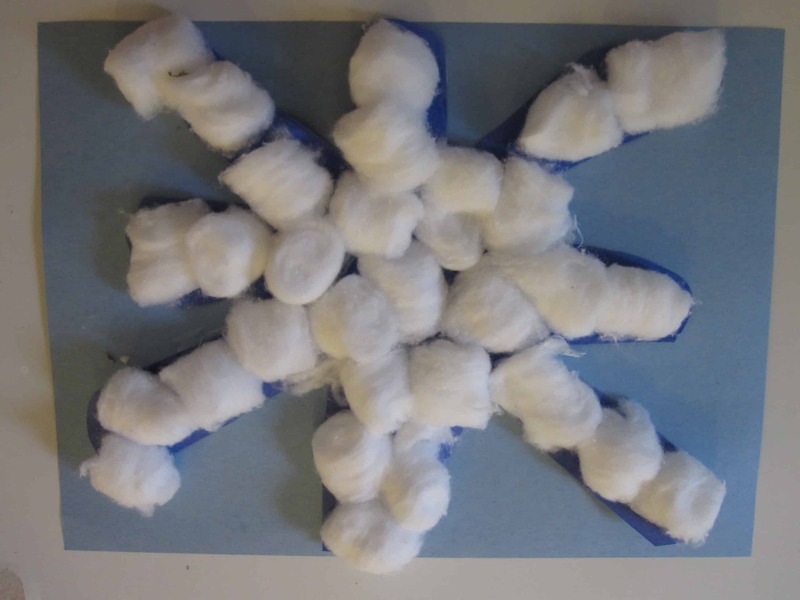 That’s why we think our kids love making these cute little cotton ball snowflakes so much! 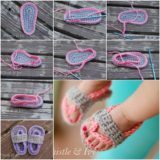 Even though it’s August right now, our little ones were actually asking to craft these last weekend because they love simple glue-and-stick crafts, as well as the feeling of the cotton on their fingers. See the whole idea in more detail on Munchkins and Mayhem. Are your kids budding artists who adore painting and creating images with colours, no matter whether they’re using a paint brush, their fingers, or another tool? Ours love painting too, but they love it even more when they get to use something unique and a little unconventional to make their pictures with. 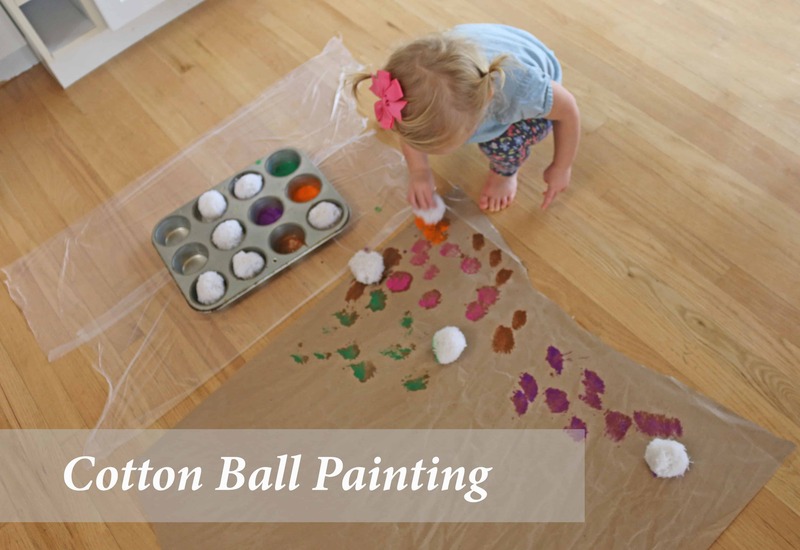 That’s why they love this cotton ball painting idea from The Nashville Mom so much! 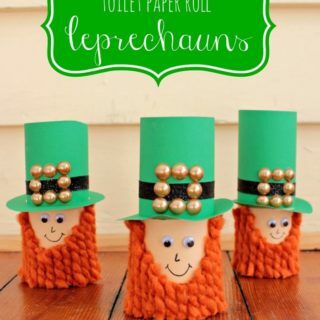 You could also do a smaller version using regular cosmetic cotton balls and standard sized sheets of paper, but things are even more fun when you make them jumbo! Handfuls of cotton stuffing dipped in muffin tins filled with paint make great “brushes” for decorating a large strip of packing paper. Perhaps your kids love colouring in pictures that have already been created for them, but they like it even better when they can use awesome or cool feeling crafting tools to fill in the spaces rather than just markers and pencil crayons? Then they’re going to love these funny little cotton penguins! Glued to My Crafts gives you a printable and shows you how they filled up the penguins’ bellies with cotton balls to make them fluffy soft, just like a real little penguin’s feathers might be. 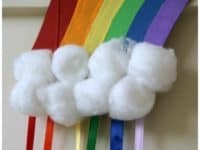 Did you love the idea of making fluffy clouds with the cotton balls like we showed you before but you think your kids would rather make something that involves lots of colour rather than rainstorms? In that case, we think they’ll have lots of fun making a craft that involves a lovely, bright rainbow stemming out of the cloud. 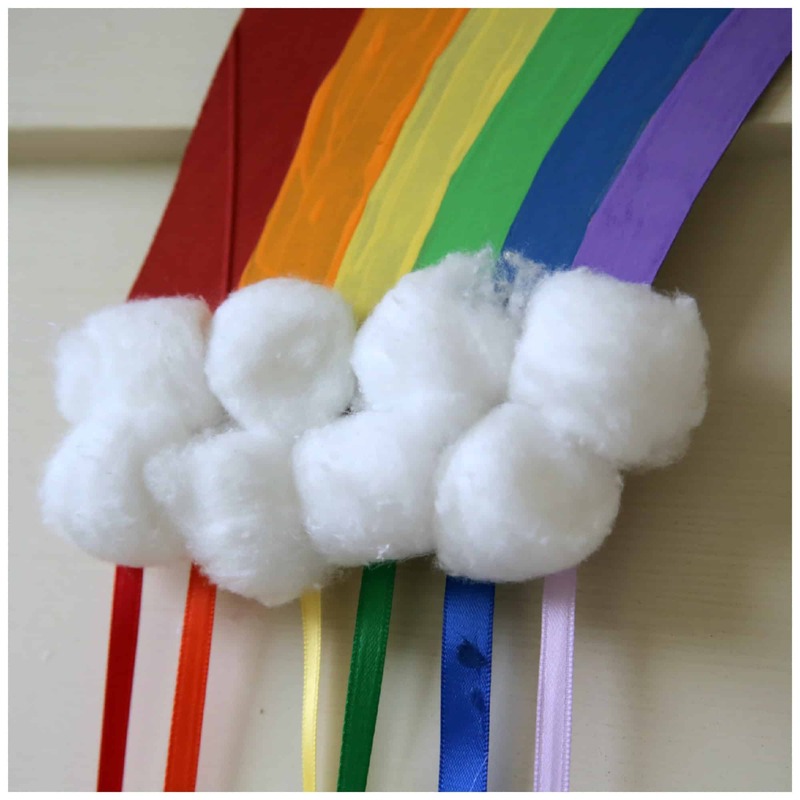 We love the way Kix Cereal used ribbons pouring down from the cotton ball clouds for extra cheer! 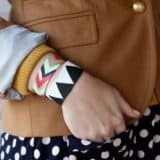 Are your kids lovers of dress up who are always making themselves accessories and costume pieces, so you keep an eye out for new DIY costume ideas that would be easy for them to make? 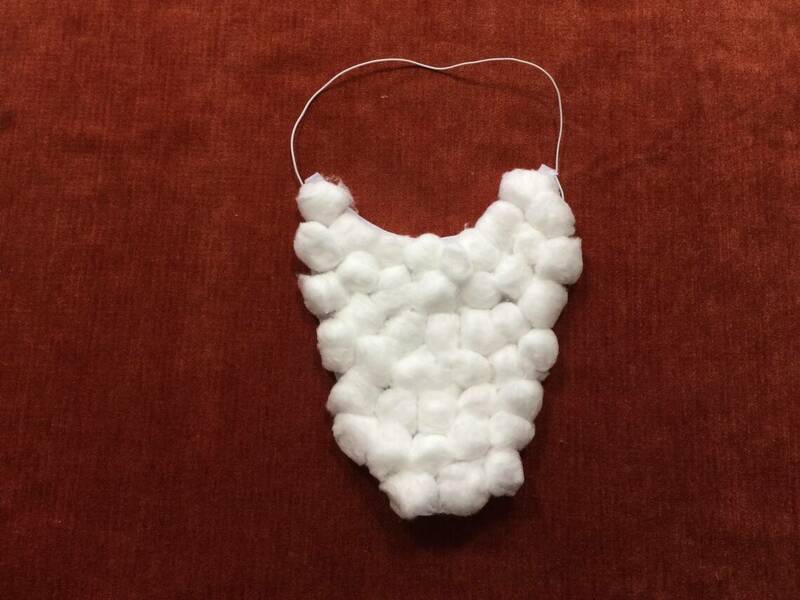 Then you’re going to love this hilarious cotton ball beard from Robeson Design! 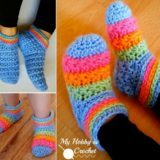 The best part is that because it’s so easy to make, your kids will get double the fun by creating it and wearing it later when they’re done.